U.S. equities are pushing higher on Tuesday as traders await the start of another two-day Federal Reserve policy meeting. A dovish outcome is expected, with the “dot plot” expected to come down to reflect only a single rate hike in 2019 and another single hike in 2020. 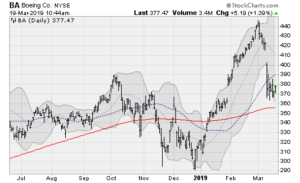 The bulls are feeling confident, once again pushing the Dow Jones Industrial Average up and over the 26,000 level for the fourth time since prices peaked back in October 2018. 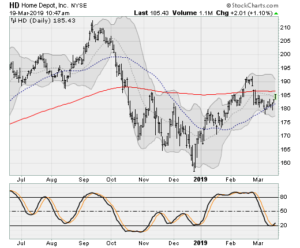 Will this rally in Dow Jones stocks have staying power? It looks that way, with global central banks doing all they can to paper over the volatility suffered late last year. With inflation at bay, they don’t have much reason to play the tough cop act the market hates so much. 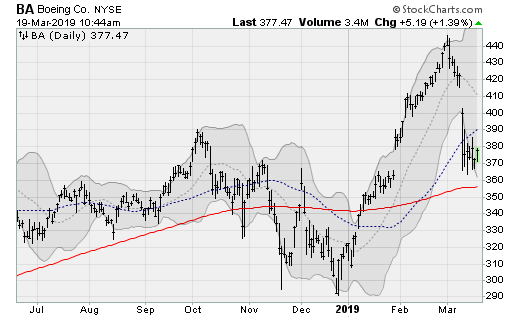 With that in mind, here are five Dow Jones stocks that have lagged the market’s rise — and will be critical in helping push the Dow definitively past the 26,000 threshold. 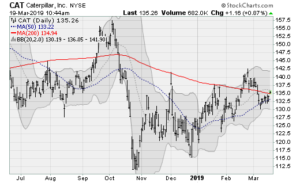 Boeing (NYSE:BA) shares have stabilized after hitting major turbulence in connection to the two fatal crashes of 787 MAX aircraft because of what looks like a design flaw connected to an anti-stall system. Boeing, under competitive pressure, reportedly buried details of the system’s operation to avoid airlines retraining pilots. Shares were recently downgraded from buy to hold by analysts at Argus. 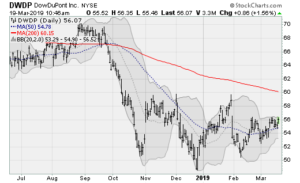 But the worst looks to be over for the company, which will have to pay to make it right before getting back to its massive list of backorders. The company will next report results on May 1 before the bell. Analysts are looking for earnings of $4.25 per share on revenues of $25 billion. When the company last reported on Jan. 30, earnings of $5.48 beat estimates by 93 cents on a 14.4% rise in revenues. Caterpillar (NYSE:CAT) shares are on the move, pushing off of uptrend channel support going back to late October. The bulls are shaking off a double downgrade day from late February when analysts at UBS cut all the way from buy to sell on worries about revenue and margin pressure in 2020. Instead, nascent hope of a manufacturing and construction turnaround are bolstering prices. The company will next report results on April 29 before the bell. Analysts are looking for earnings of $2.86 per share on revenues of $13.5 billion. When the company last reported on Jan. 28, earnings of $2.55 missed estimates by 44 cents on a 11.2% rise in revenues. 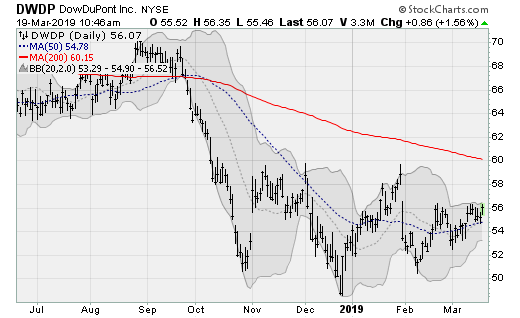 DowDuPont (NYSE:DWDP) shares are coiling up within the confines of a consolidation range going back to October, rising off of its 50-day and 20-day moving averages in what looks like the beginning of an upside breakout. The company announced this week that a broker-dealer has been selected to implement a $3 billion share buyback following the separation of its Dow subsidiary from DowDuPont. The company will next report results on May 2 before the bell. Analysts are looking for earnings of 93 cents per share on revenues of $20 billion. When the company last reported on Jan. 31, earnings of 88 cents per share beat estimates by a penny on a 0.2% rise in revenues. 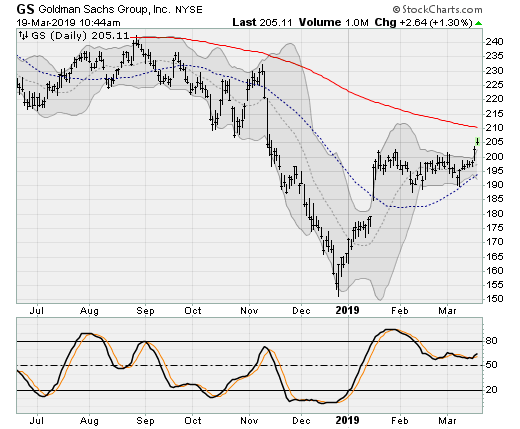 Shares of Goldman Sachs (NYSE:GS) are emerging from a three-month consolidation range, pushing towards its 200-day moving average in what looks like a possible end to a downtrend that traces back to early 2018. Investors are getting excited about reports the company is looking to launch a new credit card product in collaboration with Apple (NASDAQ:AAPL) as well as general stabilization in the capital markets, which is resulting in a reopening of the IPO window with Lyft. The company will next report results on April 17 before the bell. Analysts are looking for earnings of $5.7 per share on revenues of $9.3 billion. When the company last reported on Jan. 16, earnings of $6.04 beat estimates by $1.26 on a 0.5% drop in revenues. With the peak home-buying season about to arrive, hopes of a turnaround in home prices (which have been sagging nationally lately) are raising, and thus, home improvement demand is expected to increase. 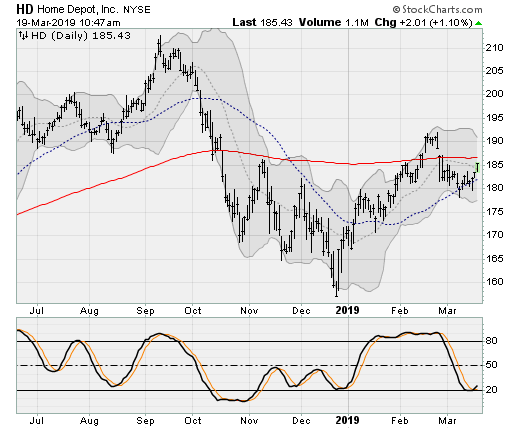 Home Depot (NYSE:HD) shares have been consolidating since October but look ready for another breakout attempt above its 200-day moving average. A couple of analyst downgrades in recent weeks, including from Telsey Advisory Group, hasn’t dampened investors’ spirits. The company will next report results on May 28 before the bell. Analysts are looking for earnings of $2.20 per share on revenues of $26.5 billion. When the company last reported on Feb. 26, earnings of $2.25 per share beat estimates by 9 cents on a 10.9% rise in revenues. 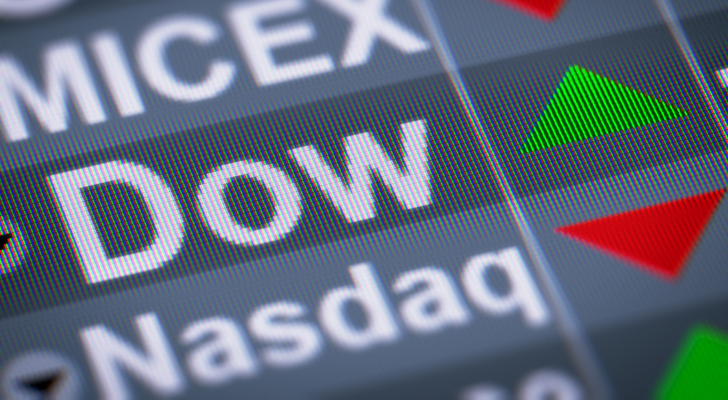 Article printed from InvestorPlace Media, https://investorplace.com/2019/03/dow-jones-stocks-coming-to-life/.